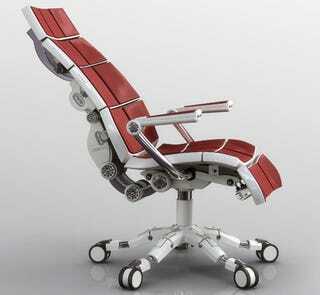 I've no way of knowing if this office chair is more comfortable than the famous Aeron chair. Or if its self-calibrating back and seat are any more "body-aware" than a bean bag chair. But the fact that the spinal support looks like a leather bound set of tank treads, is pretty freaking cool. Peter Hall, on Pop Science's website, writes about this seat's ability to overcome the human tendency towards laziness. See, In theory, the Aeron could be equally ergonomic - if only people adjusted the chair's settings every time they shifted. This chair, which I believe to be a concept, has panels that auto adjust to your every shift like a scale sinking to your weight. The bar has been raised. And won't be topped until someone makes a chair version of a waterbed with magic fingers. Geek inventors, the world is waiting with eagerness.